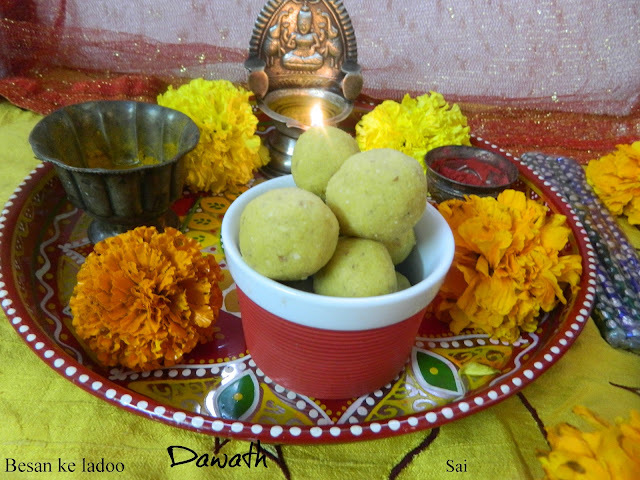 Happy Dhanterus to all!This is my 75th post.My baby blog is growing day by day.And I am really very happy for the response that I am getting and inspiring me more to do my job better. 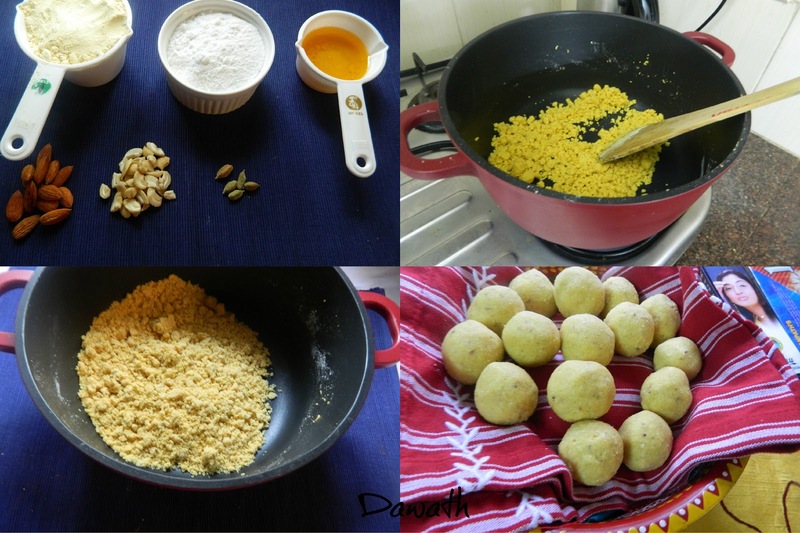 Dhanterus is the first day of the five day Diwali festival.The word Dhan means wealth and therus means 13th day as per the Hindu calendar.So today and the following next 4 days are very auspicious to us.Coming back to the recipe Besan means gram flour.I adapted this recipe from Sanjeev kapoor’s book and adjusted the measurements as per my needs.This ladoo is very popular and very easy to prepare.I dedicate this ladoo for my blog and for you people for Dhanterus! Sieve the besan through a fine sieve and set aside. Coarsely grind cashewnuts and almonds and keep aside. Melt ghee in a kadai,add besan and cook over low heat till besan is well done and gives a aroma. This normally takes about 10 to 15 minutes. Add cardamom powder,ground dry fruits,stir and take it off the heat. Finally add the powdered sugar and mix well. Use your hands to mix this. 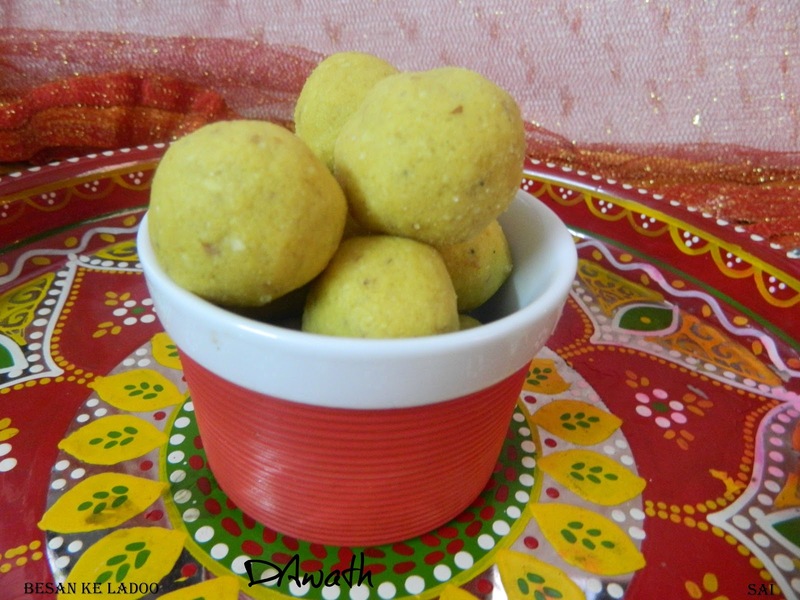 Shape it into walnut sized spherical shape ladoos and store it in a airtight container.